You have the career experience to be a valued coach. But you also know that coaching is more than just giving advice. A good coach understands that making a difference depends on knowing how people learn and change. This perspective is the foundation of our four-course/12-month Certificate in Organizational and Leadership Coaching. Two paths are available to complete the Organizational and Leadership Coaching Certificate from the Master's Program in Learning and Organizational Change (MSLOC). You may earn the certificate as a graduate certificate student by completing the four-course/12-month program. The program follows our alternative schedule option, allowing you to pursue the certificate no matter where you live in the U.S.
You may also earn the certificate while pursuing the full master's degree and completing the four-course sequence and other certificate requirements as part of your degree program. 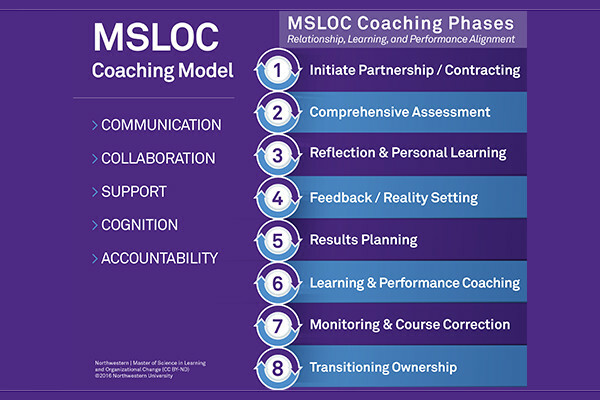 Coaching certificate cohorts begin in March of every year with a required virtual or in-person session. The required session for the 2019 cohort is March 16, 2019. Deadlines for degree and graduate certificate applications are April 10, June 10, October 10 and December 10. The December 10 deadline is the final admissions deadline before the beginning of each cohort in March. Whether you are an experienced talent management professional or you have deep understanding of organizational operations, developing your ability to coach provides new opportunities for you to make a difference. We will help you take advantage of those opportunities by preparing you to provide one-on-one professional coaching — including fieldwork — by building your skills and your knowledge of theory and practices necessary to implement coaching as part of an organizational talent development strategy. Each of the four courses required for this certificate is offered in our hybrid format — part online learning and part on-campus. You can attend no matter where you live in the United States. Develop individual skills in the practice of coaching as well as a broad understanding of coaching within the larger context of organizational performance and change. Look deeply at the theory and practices behind learning and human performance in organizational settings while building a consulting “toolkit” that will help you be a more effective change leader. Learn from MSLOC faculty, who can bridge theory and practice based on their own deep professional experiences. Study with and grow your network of working professionals with expertise in change leadership. The coaching certificate courses and class sessions are the same as those offered for students pursuing a Master of Science degree in Learning and Organizational Change. The MSLOC program draws professionals from diverse organizational settings, providing a rich environment to develop perspectives on learning and organizational change. For a partial listing of our certified coaches and MSLOC Coaching Faculty, visit our MSLOC Directory of Coaches. Here you also can browse the digital portfolios that our OLCC students construct while in the program.